We are two days away from the start of autumn, which means the leaves will start dying soon. That’s no problem, of course. Autumn brings the weather in Houston to a tolerable level (of course, we have to wait until about the end of October to experience some really nice weather). Speaking of leaves, however, these can definitely become a problem and many homeowners in the Greater Houston area do not understand why. When leaves begin fall by the thousands and millions, followed by rainfall, they can become stuck on the corners and crevices your roof. If they are not removed, they can begin to create rot within shingles and the wood paneling. Leaves on the roof become very heavy, adding unnecessary pressure to it. If the wood paneling has begun to rot, it can create cracks in the wood, which leads quickly to leaks. Leaks can lead to mold, ceiling collapse and a host of other problems. This autumn, keep an eye on your roof and those pesky leaves. Removing them is easy. Use a broom or a blower. But be safe when you are removing them. You’ll be on the roof, so don’t slip and fill. Wear shoes that provide good grip. Avoid the urge to remain in constant comfort, such wearing Crocs or flip-flops. That is a recipe for disaster. HAVE LEAVES ALREADY CREATED ROOF DAMAGE? 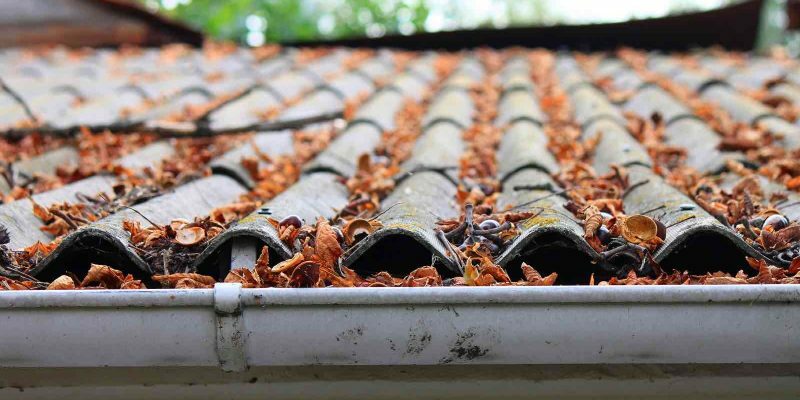 If leaves have been left on your roof for years on end, then chances are rot has already taken hold. Your roof needs to be inspected thoroughly by one of our trained roof technicians. We will be able to pinpoint problems within the structure of your roof. At Amstill Roofing, we want to make certain your roof is sturdy and isn’t susceptible to major damage. A strong roof helps ensure a strong house. Don’t let a simple problem, like gathered leaves, create major issues. Our Houston roofing company conducts quick and excellent roof repairs, as well as roof replacements. Contact our roofing company today for a free inspection. We are here to protect your home by providing you with a solid roof. We’ll even make sure there aren’t leaves everywhere. If you’ve lived in Houston for any amount of time, then you know that the summer weather doesn’t end just because summer does. 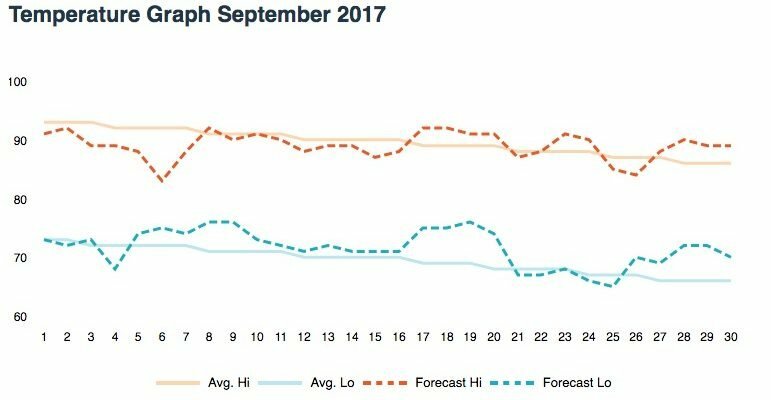 It’s been the typical brutally hot summer, and September doesn’t seem to be any better, despite autumn starting Sept. 22. According to Accuweather, the average temperatures will be a high of the low-90’s and a low of the low-70’s. This is only a couple of degrees lower than August—the hottest month of the year. To an extent, it seems only natural that September would remain hot by coming on the heels of August. So be prepared for more heat, Houston. Speaking of being prepared, the best way to be prepared is by having a roof that is prepared for all kinds of weather. At Amstill Roofing, we know how well a roof can combat the heat from the sun. A roof should be designed to deflect the heat so that the interior of the home will not become so hot. Being a GAF Certified Weather Stopper Contractor ensures that we utilize all the tools needed to make sure your home is protected and that the temperature, regardless of heat or cold, doesn’t hinder your home. Another positive, aside from just having your house feel more comfortable, is that your energy bill will improve. By updating your roof, eliminating cracks, replacing shingles, or conducting much-needed roof repairs, your roof will begin working for you. The heat and cold will not be able to penetrate into your home at nearly the rate it has been. Of course, the price of a roof replacement is not inexpensive, but with a roof that lasts no less than 20 years, the roof will more than pay for itself by the end of its lifetime. Regarding price, however, quite often your home insurance will take care of the cost or a portion of it. This is something to take advantage of. Call Amstill Roofing today and one of our trained roofing technicians will come to your home to conduct a thorough inspection. We will be able to pinpoint problems within the roof and how to address them. If you are planning to have your insurance adjuster come out to evaluate your roof, our roof inspector can join them to make sure nothing is missed. Did Hurricane Harvey Leave You With Roof Damage? Hurricane Harvey left a lot of damage in its wake as it blew through the Houston area. 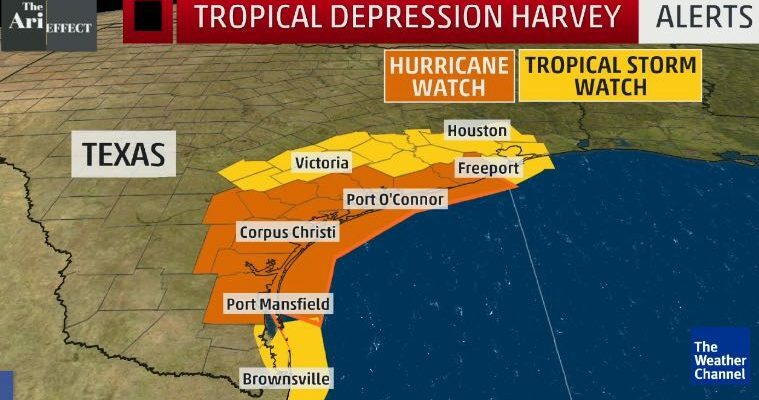 It brought a lot of rain and heavy winds, as is always expected with tropical storms and hurricanes. Hopefully your home didn’t sustain any damage to its roof, but if it did, then Amstill Roofing is here to make any repairs that are needed. During a major storm, there are numerous ways your roof can become heavily damaged. Flying debris, falling tree limbs, heavy winds that can rip off shingles, and the possibility of hail damage. If your roof was on its last leg, then chances are it sustained some type of roof damage, even severe roof damage. Don’t let leaks and cracks in your roof go unaddressed. Hurricane Harvey has come and gone, so don’t let its aftermath be worse than its initial hit. Call our Houston roofing contracting company to come out to your home and assess and fix the storm damage. Our team is highly skilled in quickly correcting any problems you may currently be encountering. Even if it turns into a major job, like a roof replacement, we can typically take care of it in one day. One of our inspectors can come check on your roof first and assess any problems and discuss them with you. From there, you can make a decision on how you would like to proceed. After a tropical storm or hurricane is the best time to utilize your insurance coverage. Depending on the type of damage left by Harvey, your insurance will cover those damages. What’s even better is our inspector can join your insurance inspector to make sure nothing is overlooked and that you get everything covered. CALL AMSTILL ROOFING FOR YOUR HARVEY STORM DAMAGE TODAY! Our Houston roofing company has been providing excellent service to the citizens of this great city since 1974. Don’t let a fly-by-night roofing contractor try to take care of your roof and leave it worse off than it was. Our roofing contractor company has been trusted for decades because of our great work. Call us today and let us take care of your Harvey storm damage. At the end of August, Houston and much of Texas’s southcoast endured the worst storm in Texas history. Our city received an unprecedented more than 50 inches and more than 1 trillion gallons of rain, which destroyed thousands of homes, some of them being buried under water. At Amstill Roofing, we were distraught over how the great citizens of our city were impacted by Hurricane Harvey. Our Houston roofing team has been hard at work since the storm has passed, conducting roof repairs, roof replacements, and roof inspections. There were thousands of roofs in Houston that were negatively affected by this powerful storm and sustained major storm damage. As we mentioned during the storm, a portion of our proceeds will be going to help with Houston’s flood relief efforts. Our goal is to help Houston rebuild. At Amstill Roofing, we know how important roofs are to the process of the rebuilding phase. We have had many of our clients say that they were proud of how their roof held up during this powerful storm due to our exceptional work and craftsmanship. We want to provide every Houston home owner with this type of work. No one should be worried about their shingles or the durability of their roof during a storm, which is why we encourage you to call us today if you feel your roof may not be able to sustain another bad storm. Part of the rebuilding phase in Houston starts with your home. It starts with one home at a time, which is our primary focus. We make certain that the roof repair or roof replacement project is conducted with excellence. In the aftermath of Hurricane Harvey, it has been very difficult to get to all of our clients and others needing help with their roofs. Some places have simply been impassable. 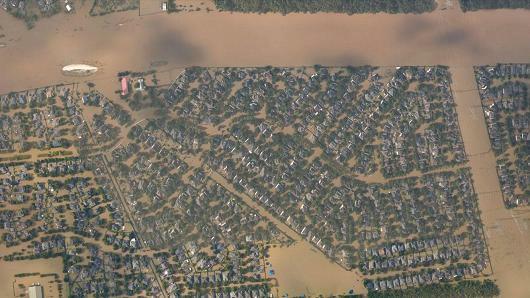 The waters, however, have continued to recede, which has enabled our roofers to get to more houses. We have received a lot calls and promise to take care of your roof as soon as we possibly can. For those who are in areas that have had streets and surrounding highways flooded, we are coming to you. We greatly appreciate your patience. WAS YOUR ROOF AFFECTED BY HURRICANE HARVEY? If your roof suffered from storm damage due to Harvey, then please contact our Houston roofing company. We have served the Greater Houston area since 1974 and we are here to serve you. If your home is suffering from leaks or cracks, our roof repair specialists can quickly correct those problems. If your roof has hit the 20-year mark, then it may be time to receive a new roof. We look forward to hearing from you and helping you protect your home.